Chole (Chickpea in Curry) – One Half Indian. My mom and two of my sisters are at the beach in North Carolina this week, and I was able to coordinate a lunch where my mom and sisters and my in-laws could all come. My cousin who lives in the area was also able to make it. It was so much fun to have both sides of the family together. Sometimes culture and geography and language can make the two sides of my family seem so distant, but when we were all in my small apartment together, I was reminded of how much we all have in common and how much we all can learn from one another. Standing in my kitchen watching both of my moms eat the food I had prepared and laughing a little too loud with my sisters, I felt truly blessed. 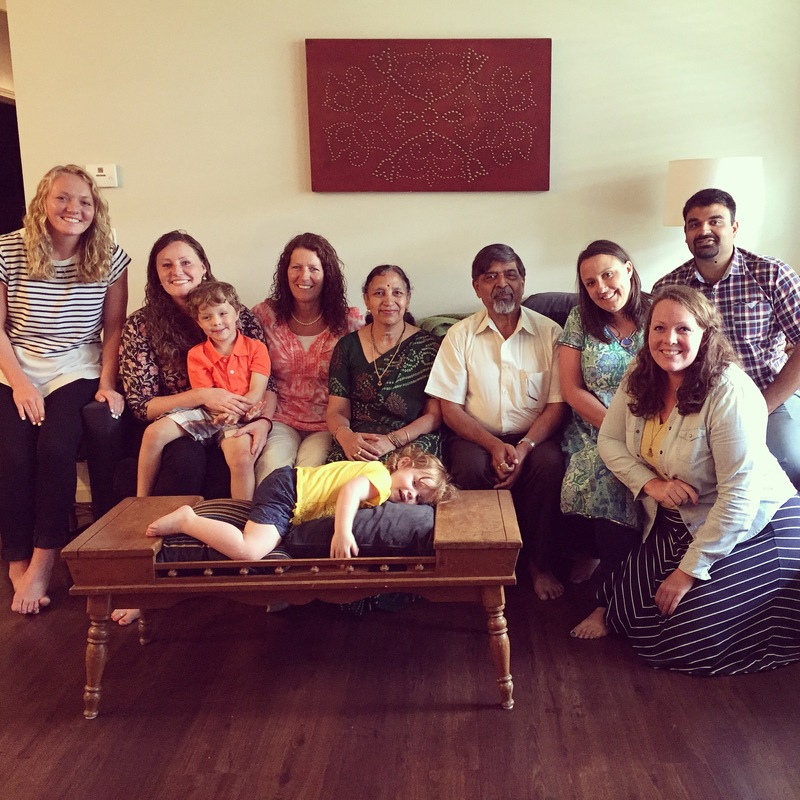 From left to right: Eleanor (sister), Me, Jacob on my lap (nephew), Gracie on the table (niece), my mom, my mother-in-law, my father-in-law, Alison (cousin), Sarah (sister), Rajat (my husband). We missed my 8 other siblings, my dad, and my sister-in-law’s family. Now, don’t be fooled, this lunch came with some stress. My mom is a carnivore; no meal is complete without meat for her. My mother-in-law is vegetarian and does not eat eggs. I wanted to make something everyone would like and enjoy and show my mom a different side of vegetarian cooking. We ate chole, eggplant tricolore, kulcha naan (I just buy this from the indian store already made and fry at home), rice, watermelon, and helbeh (an arabic cake made with semolina flour and pine nuts) for dessert. It all turned out surprisingly well, and was enjoyed by carnivores and herbivores alike. I was sure something would go disastrously wrong or I would mess something up completely, but I didn’t. Oh, I did forget to put salt in the Chole, but that was an easy fix. 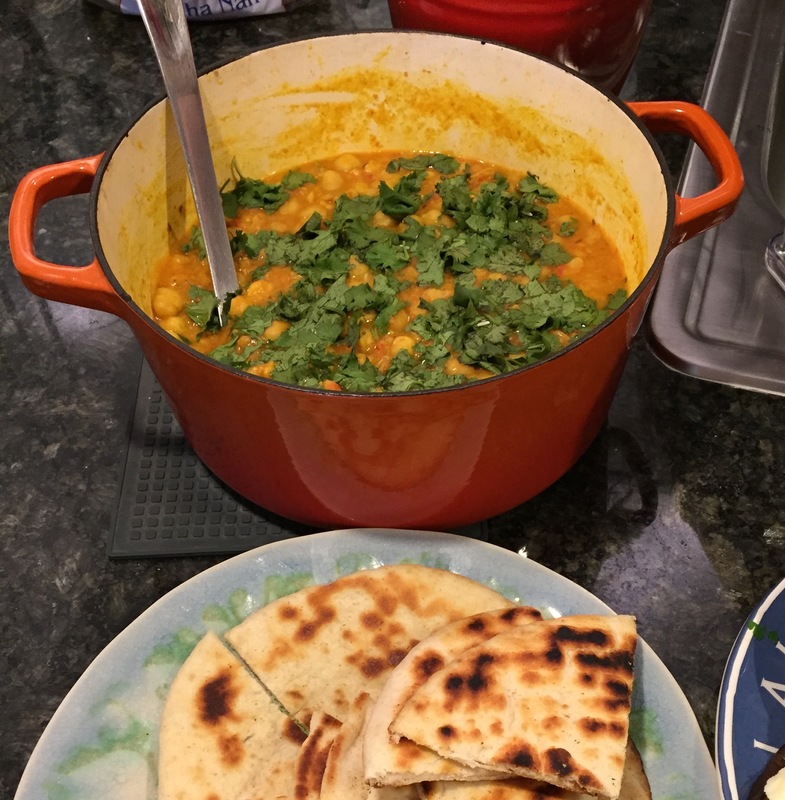 My husband and sister-in-law have both made lovely Chole for me, but I have to thank my mother-in-law for taking the time to slowly explain the recipe to me while I wrote it all down. The patience of a mother is a wonderful thing. 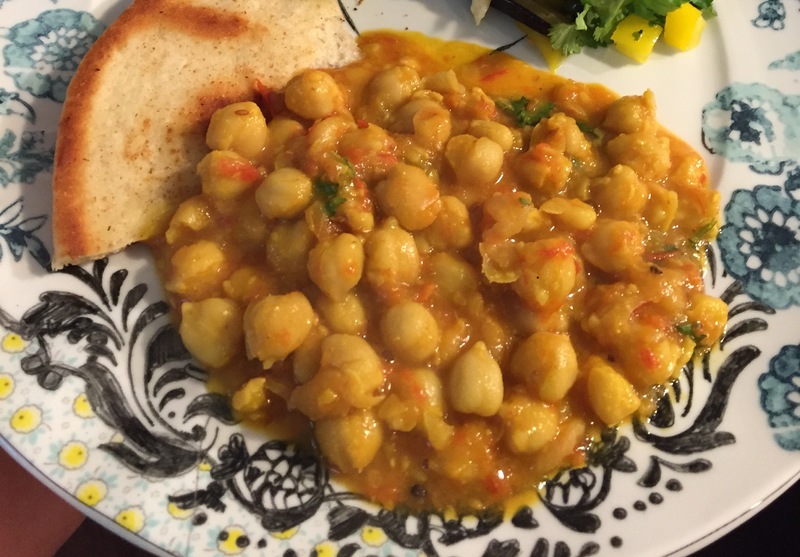 Note: You could prepare the chickpeas several days in advance and just keep in the fridge until you are ready to make Chole. 1. Place 1 cup of dried chickpeas in a bowl. Cover the chickpeas with about 1 -2 inches of water. Let the chickpeas soak for 12-24 hrs. If you leave them to soak for longer than 12 hrs, change the soaking water one time. (If you are in a hurry, you could soak the chickpeas for less time in warm water. You’ll need to replace the water a few times to keep it warm. This method would allow for the beans to soak in just a few hours). 2. After soaking, drain chickpeas. You can cook the chickpeas in a pressure cooker or in a regular pot. The pressure cooker is obviously quicker. For the pressure cooker, place the beans, bay leaf, cloves, and salt inside and cover with 1/2 inch of water. Place lid on and cook on high for one whistle. Then lower the heat to medium/low and cook for 15 minutes more. Turn the stove off but let the cooker sit on the hot burner for 10 mins more. Remove from heat and allow pressure to subside before opening the cooker (about 5-10 minutes). If cooking in a pot, place drained beans, bay leaf, cloves, and salt in a large stock pot and cover with an inch of water. Bring to a boil and then simmer for 60-90 minutes depending on how tender you want the beans. For Chole, you would want to cook for 90 minutes most likely. 3. When the chickpeas are finished cooking, drain them by putting a colander into a bowl so that you can save the cooking water. We will use this in the curry. 1. In a heavy bottom pot (I used a ceramic coated dutch oven), heat 1 tbsp of oil. Test the heat of the oil by placing one cumin seed in the oil. The cumin seed should fizz right away. 2. When the oil is hot enough, add the cumin. Wait a few seconds, then add the cinnamon stick piece, black cardamom, and pepper corns. Toast the spices in the oil for 30 seconds. 3. Add the finely chopped onion. Saute the onion until it begins to brown on the edges. 4. Add the chopped green chili. Saute a few seconds. 5. Add the pureed tomato. Add coriander, turmeric, salt, and chili powder. Stir to combine. Cook the tomato down into a thick paste. The tomato is done thickening with the tomato begins to separate from the oil. 6. Add chickpeas with the reserved water. Stir to combine all ingredients in the pot. 7. Depending on how thick or thin you want your Chole and how much cooking water you have reserved, you may want to add 1/2 cup more water to your Chole. 8. Smash some of the chickpeas against the side of the pot with a spoon to thicken the sauce and add texture. 9. Cook five minutes more to combine flavors. Check for salt. 10. Serve topped with fresh cilantro and garam masala. Rice or bread goes well with this dish.